Lupin part of attractions and theme at Universal Studios Japan next year. Details here. ‘Cool Japan’ experience. Re: Lupin part of attractions and theme at Universal Studios Japan next year. Promotional art from MP and site link. 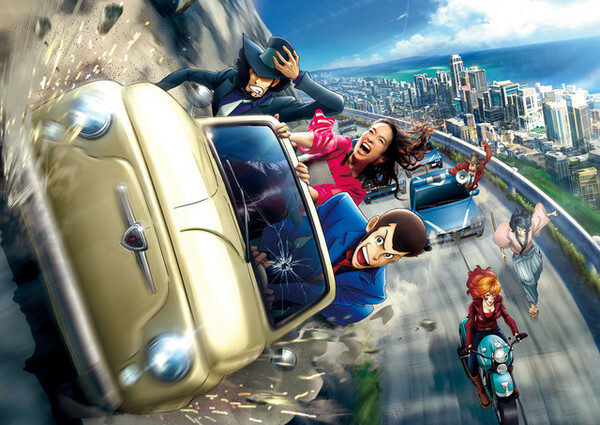 The Lupin III attraction will be a car chase XR ride. This ride will tell an original story revolving around Lupin's museum heist. There will also be a themed restaurant called "Lupin III Ristorante Amore." Details about it will be released at a later date. Someone went to Japan and took a video of the Lupin ride.